Crunchy almonds in white chocolate team up with almonds in tenderly melting whole milk chocolat and almonds in dark chocolate. Sugar, ALMONDS, cocoa mass, cocoa BUTTER, MILK, SOY lecithin, thickener: E414, vanillin, glucose. May contain traces of GLUTEN, PEANUTS and other NUTS. 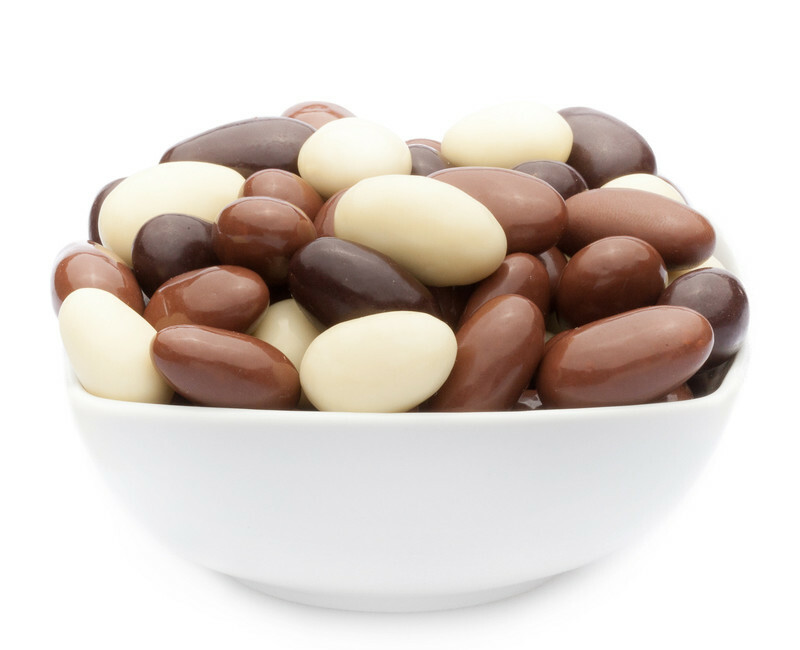 The three most popular chocolate flavours - whole milk, dark and white - cover the fine, slightly sweet almond to a cheerful chocolatey specialty of the highest quality and an astonishing look. At first, you might mistake them for tiny shiny tumbling figures, but as soon as the seductive scent reaches your nostrils they won't stay in your hand much longer! At first glance, you won't be able to imagine which eruption of sensation awaits you when you open a bag of our exquisite TRIPLE ALMONDS. A lavish layer of unbelievably tender melting chocolate surround a crunchy, gently roasted core of almond. A delight that should be repeated infinitely and leave fulfil all your chocolaty dreams! Chocolaty variety at ist best! The whole milk chocolate enters a bewitching bond with the gently roasted almond, while the dark chocolate wonderfully highlights their slightly sweet aroma. And the white chocolate rounds off the crunchy almond taste to a new flavour dimension. It's really hard to pick a favourite - the good thing is, you don't have to! Simply enjoy them all!